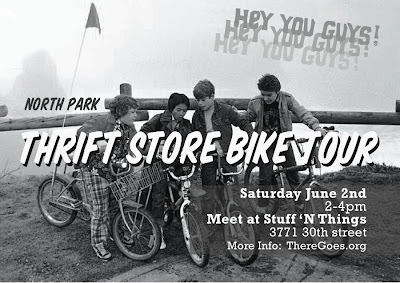 Please join me in a leisurely community bike ride as part of the 2nd annual There Goes the Neighborhood event in North Park, Saturday June 2nd from 2-4pm. 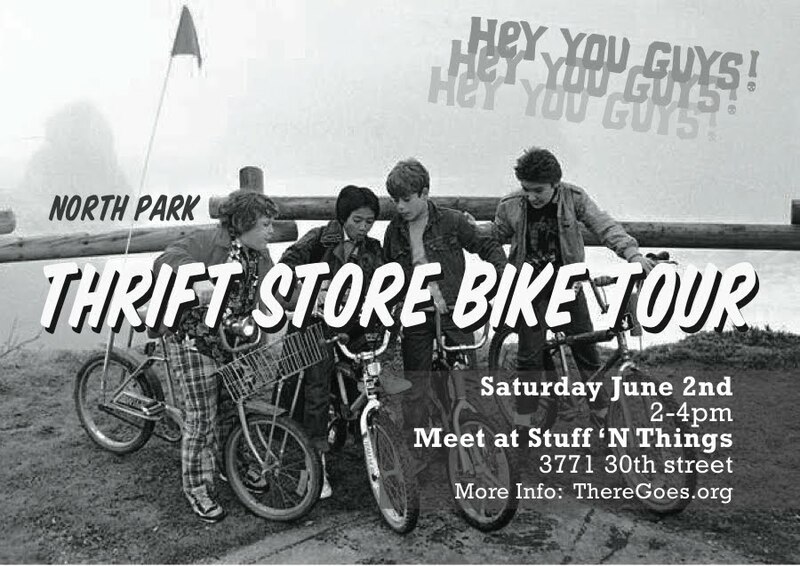 Set as a pub crawl type/ open participation invitation, the ride will take place over a couple hours and span roughly 3 miles within a few blocks of University ave, stopping at a variety of local thrift stores where we can scrounge for some used goods! bike/ scooter/ moped/ unicycle or wheeled object of your choice. The tour will end at Art Produce on University between 4 and 4:30p. If you would like to participate in a shared collaboration of documentation for the weekend, including a zine making workshop on Sunday, bring along a camera. This event is open to people of all ages, and is free. The more the merrier so bring a buddy. Also, if you don't have a bike and would still like to participate, here is the route of stores we will visit. Just meet and walk along! The last 3 stops are literally just across the street from each other. *Thanks to all who came out and joined in the event. Here is a great spread of photos and a recap from the day from my talented friend Chris.